Our expanded metal foils and polymers improve the performance of filters, particularly in industries where resistance to high temperatures or caustic materials is essential — including semiconductors, chemicals, and pharmaceuticals. Filtration and separation are key criteria for industries that produce semiconductors, process chemicals, and pharmaceuticals, or systems that control gas or liquids. Dexmet custom manufactures MicroGrid® and PFOA-free PolyGrid® materials in a multitude of open area configurations with controlled pore sizes to provide more consistent particle removal, flow rates, and pressure drops for your filtration application. 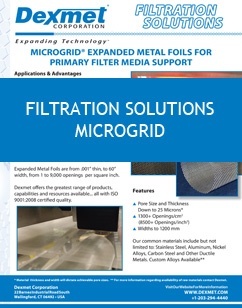 Expanded MicroGrid® can be used for either primary filtration applications to protect critical downstream components or as internal cores to support the filtration media. Typically, expanded metals are used for these applications because they require strength and operate at higher pressures. Expanded PolyGrid® materials are used primarily as membrane support materials on the upstream and downstream of the membrane. Expanded polymers can be used as a primary filter but typically for lower pressure air or gas applications. Dexmet produces PFOA-Free PolyGrid® expanded Fluoropolymers. PFOA (Perfluorooctanoic Acid), widely used as a polymerization surfactant in making fluoropolymers including PTFE, PFA, and FEP, has fallen under scrutiny by the EPA and FDA for its potential toxicity and widespread presence in the environment and human population. Utilizing Dexmet's fluoropolymers will ensure that your application meets any new EPA or FDA requirements while being safe to the environment. Dexmet custom manufactures PolyGrid® high performance materials from fluoropolymers and thermoplastics with controlled pore sizes to provide proper particle removal with more consistent flow rates and pressure drops for your filter application. Filters that are designed to remove fine particulate (less than 0.1 mm) frequently employ non-woven filter media that requires mechanical support within the filter body. The support must provide adequate strength while not significantly reducing the flow of the fluid to be filtered. Dexmet specializes in offering expanded fluoropolymers and thermoplastic materials that are often difficult to obtain in either extruded or woven product. Particulate passage is controlled by the opening size or “pore” diameter of the media and is designated by a Micron rating. The opening configuration (pore) might be diamond-shaped (expanded), square (woven wire), or round (perforated). Designate the opening according to the particle size required to be separated out of the flow path. Flow backpressure results from the “percent open area” and the degree of particulate build-up on the media surface. Choose a material that will more than withstand the full pressure drop across a blocked surface area. Ultimate strength is controlled by material selection, thickness, percent open area and pore geometry. 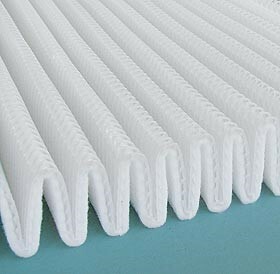 Multiple layers of filter material with varied openings can improve flow, purification, and withstand higher backpressure. 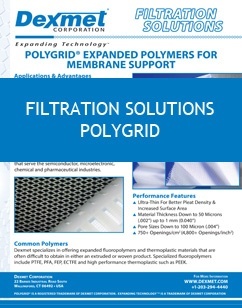 For information on the advantages and characteristics of PolyGrid Filtration Media and Membrane Support materials, download this free data sheet. Dexmet expanded metals are used in filters as both filter media (for coarse particles) and internal support cores for fine filter media (especially non-woven fabrics). Dexmet can provide a wide variety of metals and geometries to exacting specifications. With so many materials and configurations, Dexmet has the right material to maximize filter efficiency and usable life, while reducing internal corrosion and other failure modes. 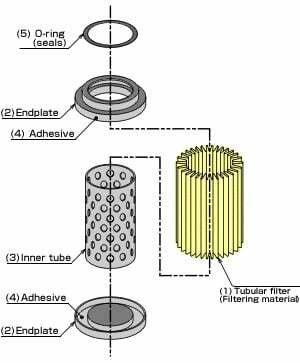 Filters (or pre-filters) that are designed to remove large particulates (over 0.5 mm in diameter) must be made to withstand impact stresses as well as fluid pressure. “Open” (expanded, perforated or woven wire) metal foils are frequently used for this function because they can be easily formed for the specific application. Stainless Steel, Aluminum, Nickel Alloys, & Carbon Steel (FE). Dexmet has the capability to expand all ductile metals. For information on the advantages and characteristics of MicroGrid® primary filtration media and internal core support materials, download this free data sheet. Let us help you optimize your filtration system design. Contact one of our experts and start the conversation!